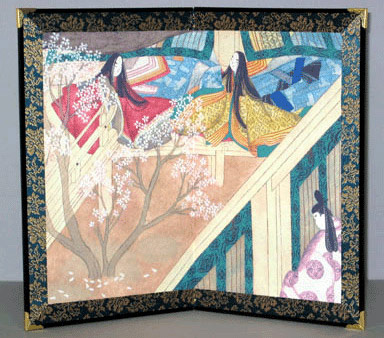 Design: This screen has two panels that depict a scene from Lady Shikibu Murasaki’s famed novel Genji Monogatari. It is painted in the traditional Yamato-e style. Size: 25x15 cm (9.8x6 inches) per panel. Design: This screen has two panels that depict a scene from Lady Shikibu Murasaki’s famed novel Genji Monogatari. It is painted in the traditional Yamato-e style. The scene captures two princesses playing the Asian board game Go under a cherry tree in a garden.